Ruby Jewelry Everyone’s Wearing This Year! Look around you and you will notice that everyone has one ornament of jewelry or another. From rings and necklaces to cufflinks and anklets. There is at least one piece of jewelry on every fashion savvy people. So, for them, this article helps to add that additional charm that you need to complement your dressing. Just check out any red carpet event and you will see that there are a lot of celebrities that appreciate the use of jewelry. Most of the time, you see a necklace with gemstones pendant or rings and earrings that have stones like sapphire, diamond or the mother of them all (in this particular case)—the Ruby. 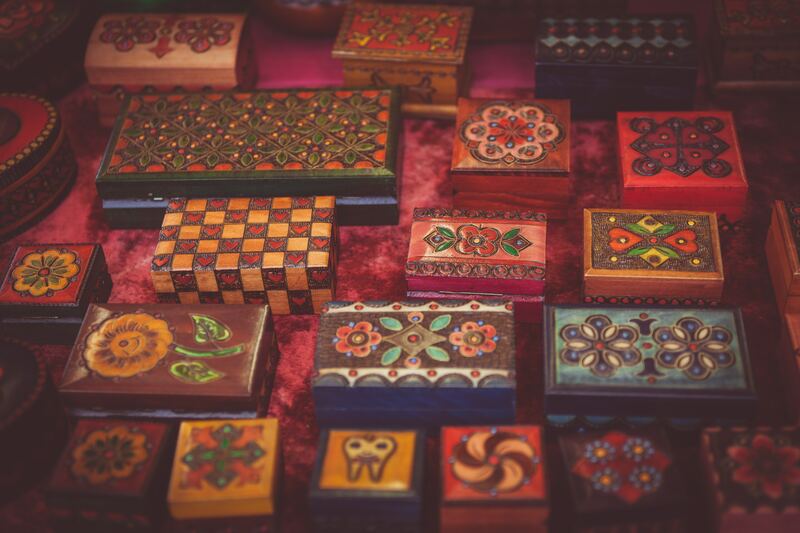 Our fathers have them as family heirlooms and in the case, if you have none, you can be the first to start the tradition. Rubies complement in a striking manner to grab attention in every scenario they’re worn to. So, with the variety of the stones that we’ll be considering together below, there is surely one that suits your expensive tastes. Ruby history is quite interesting and even though the exact time it was discovered cannot be traced. 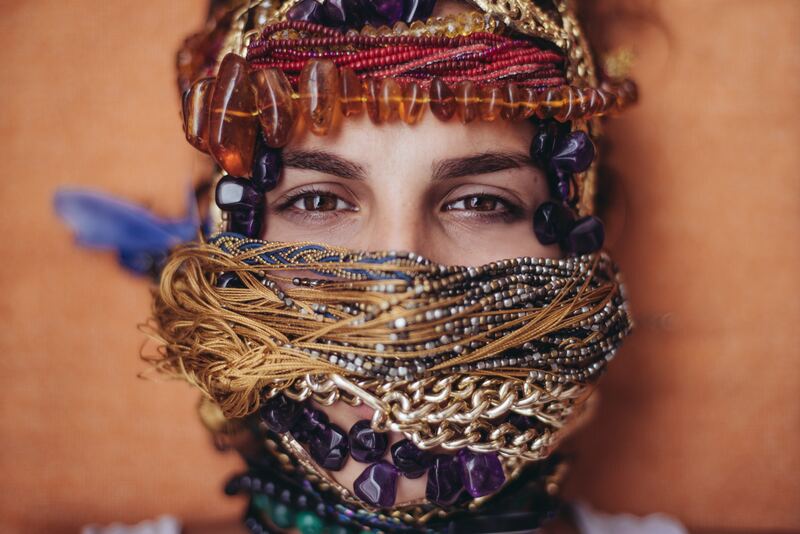 Its story is rich in culture, myths, and societal relevance and that’s even before it entered the market as the go-to jewelry type. In other words, reverence has never been far from it. Popularly known as July gemstone and having a Latin name (ruber which means red), Ruby is a red alluring stone usually considered as sharing the color of deep emotions like love, righteous anger and then fury, and passion. In fact, as most Ruby lovers know, the redder the Ruby, the higher its value. It was discovered long before the bronze age and can be found four times in the bible. Culturally, Ruby is very significant as its color is used to amplify the essence of life itself. Some believe that it is similar to the life essence of most living things in the world (blood), and this makes it the significant totem for the power of life. In ancient lores, Ruby was believed to be a precious stone that could shine through your cloth and possessed enough fire within to make water boil (interesting tales right?). 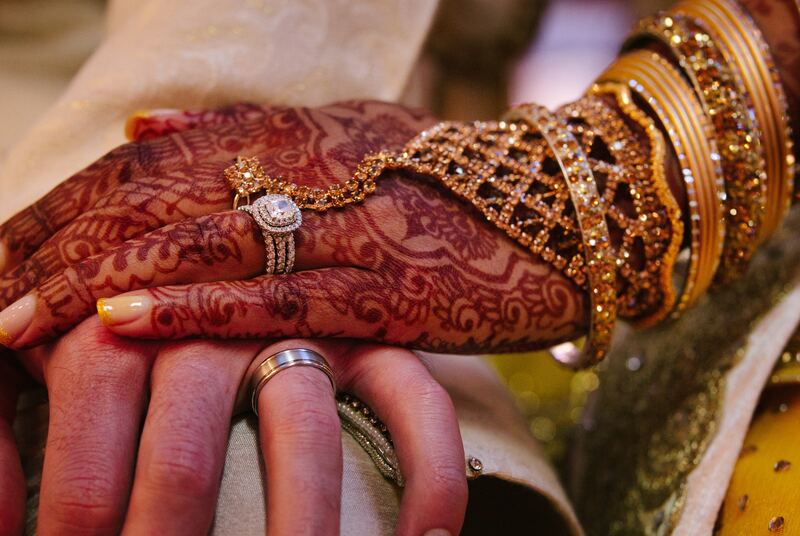 Hindus call the gemstone the king of precious stones and the leader of gems. They also believed that Ruby could be possessed to achieve a state of peace from your enemies. In addition, there is a belief that it can help preserve mental and physical health. Although you may find that point far-fetched, it does have that bit of punch behind it. When the stone was discovered in Russia by Ivan the Terrible, he proclaimed that they were good for the brain, the heart. Some of the beliefs were also quite general with the 13th century defining the stone as one that could cure liver problems when in powdered form. Moving to the 15th century, you’ll most likely witness your Ruby jewelry being crushed and used to cure poison and restore youth and vitality. With so many types of Ruby available, you may be finding it difficult to find that perfect shade for several of your outfits. But not to worry, there are several arrays of Ruby necklaces, hand chains, and even rings that you can vibe with. Also, don’t forget to always buy Ruby necklaces that are actually worth it. 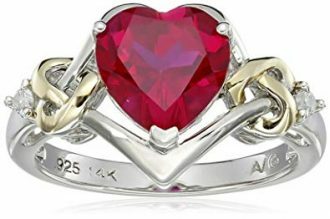 Amazon curated collection offers only the best and one of the jewelry in their collection is a heart-shaped Ruby that’s contained within a 14-carat yellow gold band. After, round white diamonds are mixed in, which is perfect if you prefer the attention like we do (why buy jewelry you can’t show off). The beautiful combinations is just right and still sparkles brilliantly to make you resplendent no matter where you are. Another great use of this ring is for weddings, you can use it as an engagement ring, that’ll be the talk for a long while. Although, you should know that the memories that’ll be created with the ring worn will make it a favorite that can stand the test of time. Friendship, contentment, love, passion, life, and many other emotions are what Ruby stands for. This July gemstone is no exception to that rule. 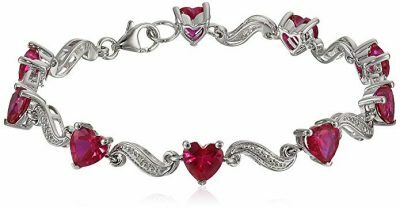 Amazon pours all these emotions into the elegant and striking bracelet. 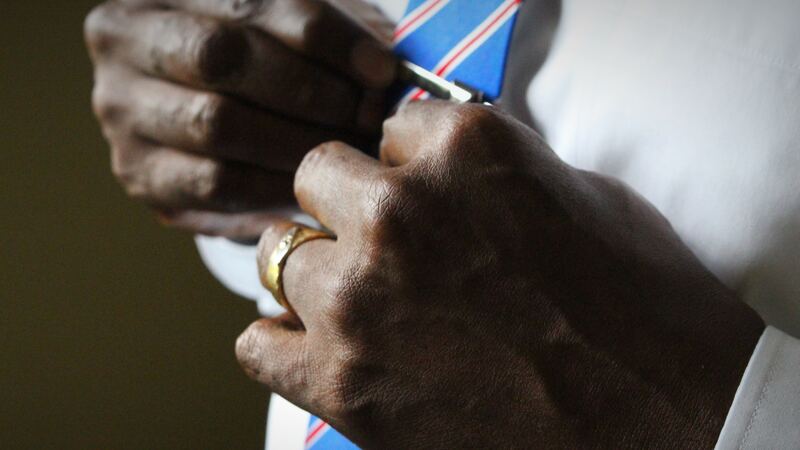 The bracelet complies with the ‘Kimberly process’ just to ensure that there is no conflict. And with its 0.32-ounce weight, you won’t be uncomfortable wearing it. You can go for sterling silver or gold. 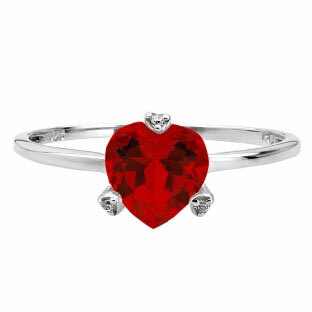 Either combined with diamonds and heart-shaped rubies that pop at any event. An important piece of jewelry that most ladies cannot do without is the earring. With much attention on it to make sure that it complements the eyes and still look simple enough to make you modest. This 19.45-carat pear shape bracelet is beautiful as well as modest. 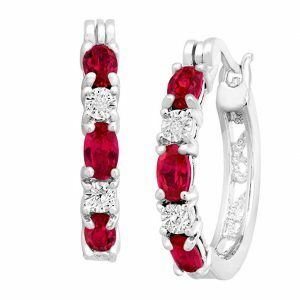 The earrings are made of top-notch sterling 925 solid silver and set into the tough silver is a red Ruby beautiful enough to get you that sparkle you need to make your presence felt. Looking at the design, the small stones set around the oval shape sterling silver are 1.3 mm each and the Ruby itself is 16 * 12 mm. Choosing the earrings will be one of the best things you can count on to add that special effect to your day. For your budget, the price of the earrings is not so exorbitant and they are also a wonderful gift for your wife or that girl that is special to you. If your partner has a healthy like for red, you could definitely give her finger a break from the engagement ring by choosing this particular piece. The ring produced is made with 7.19-carat Ruby encrusted in a 925 cocktail silver band. Along the body, there are diamond studs that glimmer and give a kind of fire and ice effect, when you look at it with the big Ruby encrusted. 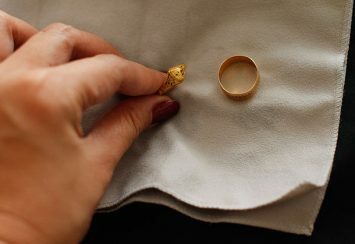 If you do buy the ring, you have the option of choosing either a cardboard box or cherry wood boxes with plush inserts. We urge you to go for the latter option if you’re gifting it since your attention to detail can make all the difference (women love that). The 14 * 10 mm oval-shaped Ruby stone is created synthetically and heat-treated just to give you a quality that actually lasts despite daily use. We definitely prefer our jewelry being flexible for a lot of scenarios. It’s already expensive and the stress shouldn’t be another issue that you have to navigate around. So, what’s perfect is a necklace. This particular one comes with a lot of class and quality and totally brings out your neckline. The infinity necklace is charming and weighs a comfortable 0.8 ounces. With the chain itself being made from sterling silver into a Rolo design, it’s just what you need for the evening. Now, to cut to the chase, even we would love this necklace. The Ruby at the center symbolizes the heart and the love contained within. So, it’s definitely that perfect gift that’ll represent a lot of the love shared between you and your partner. If you can manage to combine the necklace with a black slit maxi dress and Ruby anklets, it’ll make for a gorgeous sight. With that, your partner is ready for that anniversary date or maybe it’s work-related (product launches or dinners). Though of course, the Ruby piece can be worn to simple occasions as well. We have something special and creative for you in the form of the Time in bottom jewelry. 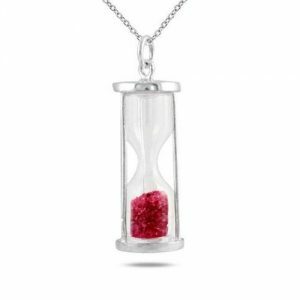 Simply put, it’s a small hourglass that houses tiny pieces of Ruby. Each one packing enough light to shine (somewhat of a grainy effect) with every move you make. The height is 21mm while the width is 8mm. 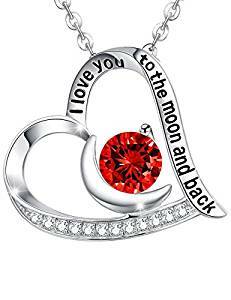 All on an 18-inch chain that is sold in a jewelry box, perfect as a gift to either yourself or others (pendant design means you have all the time in the world for them). Despite the expensive look, the necklace is affordable while also keeping its presence. You can carry other stones with the Sterling silver chain depending on your mood for the party. Rubies don’t need to be big or heavy before they make a great fashion accessory. Their twinkling red more than easily catches the eye of people around you, hence, the reason for the compliments. FineCraft is one of the best jewelers in the market, with the production of exquisite hand-crafted and quality pieces of jewelry. 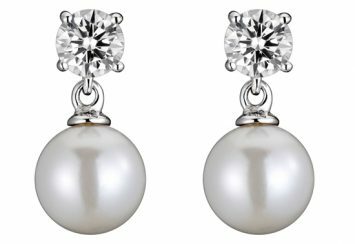 In this case, their earrings are perfect and should be included in your collection. 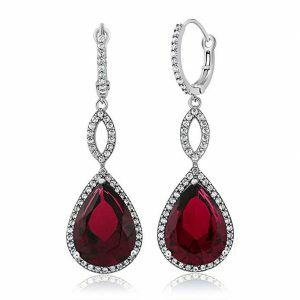 They come in a modern oval shape with the rubies joined with diamond accents in a platinum over brass hoops. The hoops measure just about 1.6 ounces, with each of them being 7/8 inches in diameter and with diamond stones that are classic white to complement the design. The six-oval cut rubies of 2 carat and diamonds beautify the earrings well and adorn the round-cut accent. So, they can definitely be your go-to wear for everyday casual use or you can whip them out for gracing special occasions where you need to hold back a bit. Finally, we have something that the men (the one in your life, if this is a gift) can use also. 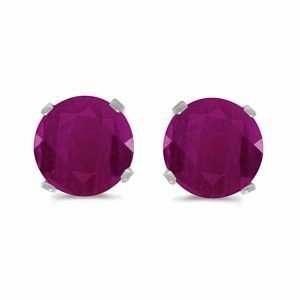 The stud earrings combine white gold (14K) with a round Ruby stone to make the pair the ideal wear for mostly any scenario. It’ll bring out your hairstyle and face, in a manner that most people won’t even be able to notice. Think of it as a portrait picture, that pushes attention to all the natural arcs your face has. The Ruby has a size of 4.6mm (1 carat), with powerful vintage cuts along the edge for more appeal. And with a weight of only 3.2 ounces, it comfortably fills in the space. Get two sets of this (the other for your partner), and make sure you create fond memories with them, that’ll always maintain that flame between you guys. Hey, it’s actually possible for you to get a dazzling red without it being too much. It all just depends on the shade, which this piece combines with solid gold. The natural pear-shaped drop pendant necklace is made in the USA and comes with its own 1.15-mm-thick double link rope that drops just below your collarbone. The gold that carries the 1.75-carat Ruby has a purity of 14K. If the Ruby doesn’t steal the attention, it will. If you want to give it as a gift, it also fits perfectly into the role. The manufacturer has even made it easier with the beautiful black velvet box that it comes in, so you won’t need to do any extra packaging. If the Ruby wasn’t big enough, we wouldn’t say this. But as it is, it’s perfect for your daughter since the extra attention it brings is something most kids love. If you weren’t interested in what this company has to offer, then you should! With a name like Angara, which is a term that is coined from ancient Sanskrit and means “the fire within”. Their tear-drop necklace is a masterpiece that should be worn to any of your next events. We say this because you get to choose between a range of precious metals, that’ll go with the tear-drop shaped Ruby (1.6 carats) that is right in the heart of it. If you’re operating on a budget, we say you go for Sterling silver. Otherwise, platinum and white, yellow, and rose gold are the other more expensive options that you can consider. 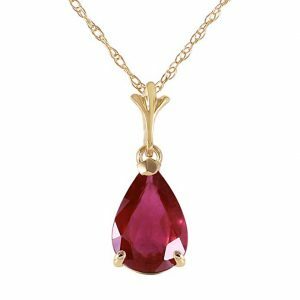 Since Ruby jewelry is primarily red, combining them for different occasions is actually straightforward when you look at it. So, combine this Angara necklace with the Finecraft earrings above. So you see, rubies have certainly come a long way in fashion, culture, and history. It has had the luxury of timelessly floating through different times while still staying relevant to both our ancestors and us personally. The gemstone was first mentioned in Exodus and it is the gemstone for all those born in July and represent Cancer, it represents your encompassing love for literally everything! This includes your passion and undying fire. So, add it to your fashion accessories and bring out that sparkle that lights up the party! 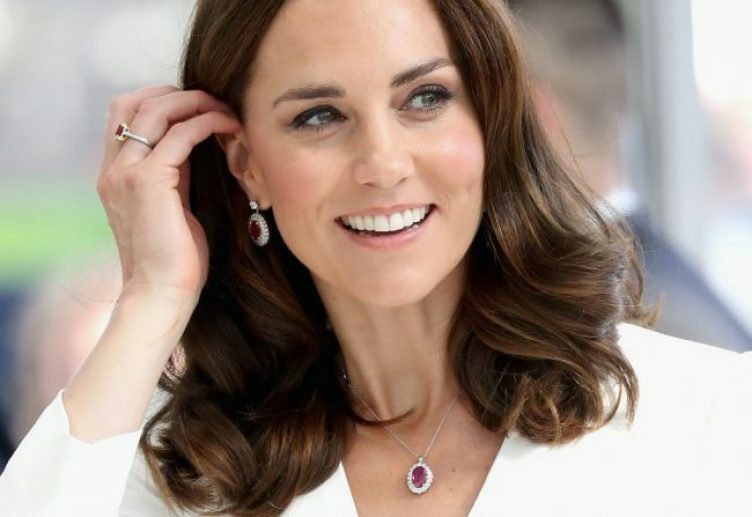 Which Celebrities are Wearing Ruby Gemstones? Well, that kind of beauty would have attracted someone sooner or later, and it happened to be royalty. 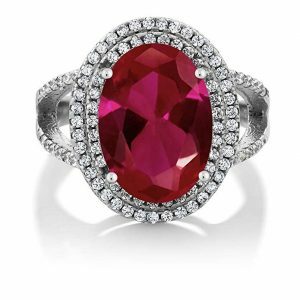 When so much value was placed on the gemstone, Ruby eventually found its way into the royal families of England and became used in coronation rings. You’ll notice that even the ring used for the marriage of Prince William and Kate Middleton saw the use of a Ruby as an engagement ring. And it is that exact same one that once decorated the hands of Princess Diana, mother of Prince William. Moving on, Scarlett Johansson and Taylor Swift use their Ruby jewelry on their fingers while Naomi Watts prefers it mixed in with diamonds in her earrings. So, if you have an event coming up, you might want to pick a style or the other from these celebrities. What are the Style Tips Using Ruby? 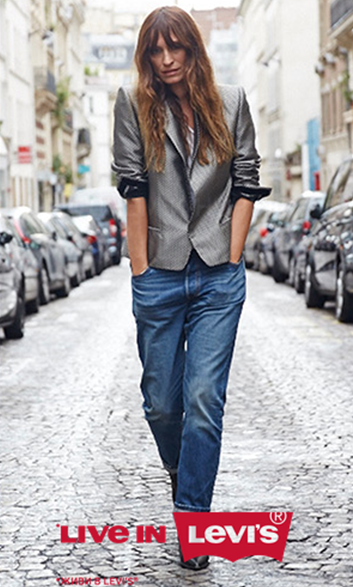 Well, when it comes to the style you want to work with, there are some factors that we look at. Amongst which, the most important is to check the outfit that you’ll be wearing—since we consider it an actually must for it to complement your Ruby jewelry. 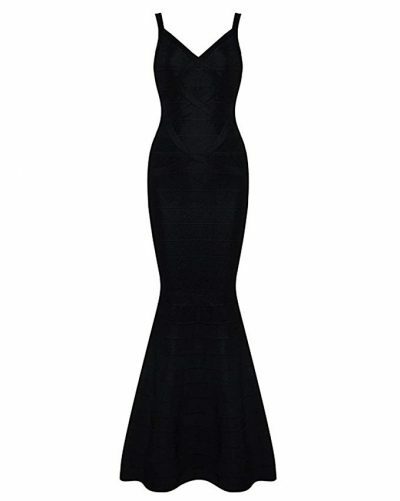 A cocktail dress is great for events like dinners, charity events, and launches. With a gold cocktail dress, you can go with a simple gold necklace using octagon Ruby stone as a pendant. Couple that with Ruby earrings and a gold bracelet, and you’ll create a strong pose. For couples, encourage your partner to wear a contrasting color (gloomy black) that brings out both your presence. Are Rubies Only for Women? Nope. Whenever jewelry is being mentioned or accessories apart from cufflinks and watches, a lot of people automatically think, “That’s feminine!”. The cliché applies to rubies also, but the pattern is totally not true. Nowadays, Ruby is as good on men as it is on women. You should definitely fit your man with a necklace, using the stone as a pendant. If you are into rings or you want to replace his piercings, go buy some that involve Ruby. How to Tell if it’s a Real Ruby? For one, you wouldn’t appreciate the fact that you bought a fake Ruby jewelry (personally one-on-one from the seller) if the seller places the price tag of a real one on it. Now, when you pay for that kind of price and it’s even a gift, what do you think the person you’re gifting it to will feel? We can probably take a guess and say it’ll be embarrassing since we’ve been there too (we would rather have avoided it to be completely honest with you). Heck, she or he might be offended you’re buying cheap jewelry when you claimed it was expensive. Albeit there’s no price tag on relationships, trust and respect are two things that have a lot of value to both parties. So, you should be able to avoid harming either of the two. With that, on to the ways you can spot a fake Ruby coming your way when you’re a mile way away. 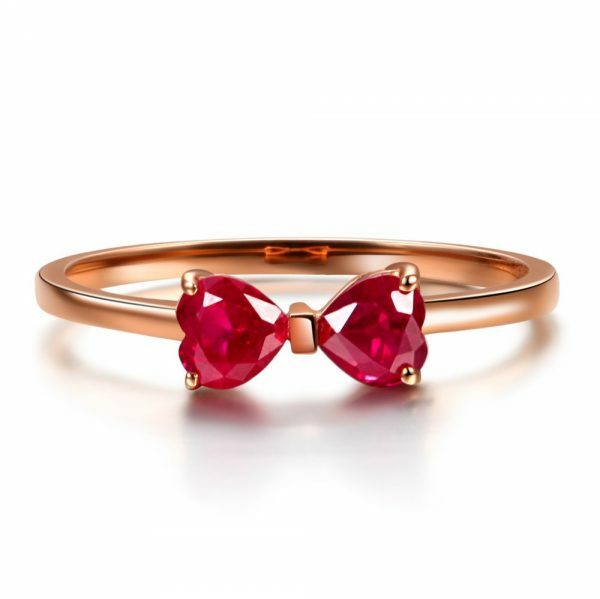 Rubies are even synonymous with red. So, the kind of red that you should be looking for is strawberry red. Your Ruby jewelry should be vivid and attractive, the red not changing in intensity regard of the direction/angle you tilt it. It’ll be punchy when you stare at it head on and the clarity won’t shift, so it’ll always attract light whenever it meets any. This is why it glows at any angle on your person when people view it. Fake rubies will have a dull red, which are never that bright, and you may even find inconsistencies in the color. Tilt it to the right, left, up, or down, and you may spot dull tones of red all around. 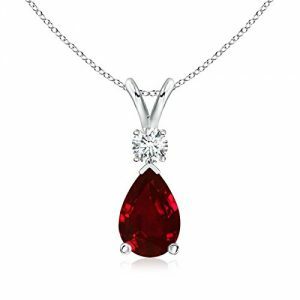 You may of course, find rubies that are a darker red than the usual bright ones. Those ones are more expensive, so be careful if you find a price that’s too light, as it may be a fake. You’re paying a hefty price, so it’s only normal you do some inspection before you pay. So bring two shards of red glass along and do a direct comparison with the Ruby stone you want to buy. If the stone feels just like another shard of red glass that’s just better shaped and even has the same kind of clarity and intensity when you look at it and even tilt it, it’s probably a fake. Avoid things like this please. Ok, find a coin, knife, or sandpaper, and rub it against the Ruby; if you notice little grains being rubbed off, or in some cases, chunks at a time (actually happened one time), then you definitely have a fake. If you don’t have the heart for using any of these tools (it’s absolutely normal), then you should try using your fingernail to scratch the stone. You’re safe if no scratch or even color appears. Although, we very prefer those tools we mentioned, as we like to push our stones, to see if they’re fully worth the price. Round rubies over 1/2 carat are suspicious too. Most rubies that are over 1/2 carat are usually cut into complex shapes. Teardrops or pears are common designs since they look gorgeous. To tell you the truth though, these methods aren’t always guaranteed to work and what we advise you to do is to take the jewelry to a licensed jeweler to have a look at what you have going. At the very least, what we aim to do with these methods is to eliminate the risk of buying a fake for either yourself or your loved one. On another note, can you try spotting dupes from the products up there? Without using the price tag to help yourself out of course. How to take care of Your Ruby Pieces? Other than diamonds, rubies are the next expensive per carat. And if you personally have a taste for Sterling silver or gold, then the expenses, as you understand, will definitely go up. So, it’s perfectly normal to want to protect your interests. 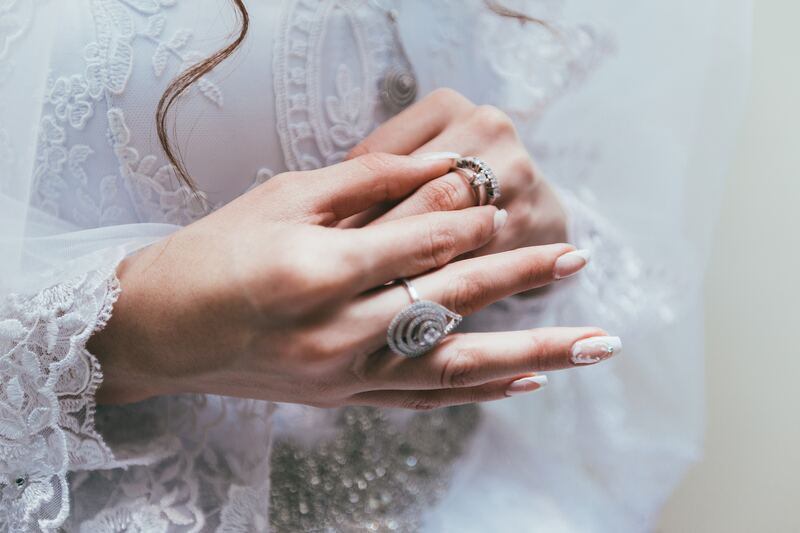 To give your jewelry that extra shine for your next event, use ultrasonic cleaners to keep them clean or you can opt for a soft cloth you have lying around if you’d rather save the time and money you’ll spend in getting an ultrasonic cleaner. Also, we advise you find a professional jeweler for proper repairs of your jewelry.